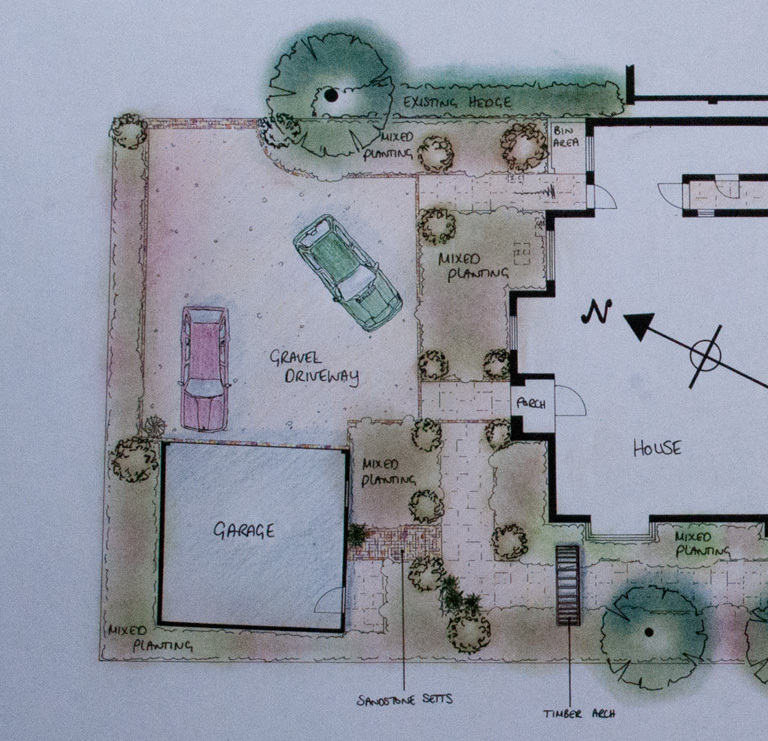 The design for the front garden has largely remained the same but it will now be constructed with gravel and edged in sandstone setts rather than the proposed resin bonded aggregate. The driveway has been extended to allow space for additional parking. The timber archway at the side of the house will create a boundary between the front and back gardens without closing off the side access completely. The long pathway between the front and back gardens will be wide (1.7m) to allow space for the planting to spill over the paving. This will soften the edges and trick the eye in to thinking that it is a winding path – a much more relaxed feel than the formality of a straight-edged path. There have been some changes to the design for the back garden but the overall feel of the garden has remained unchanged. Unfortunately the budget would not allow for the curved and undulating wall so instead we will create a feeling of height at the back of the garden with trees and large shrubs. The existing oak trees beyond the end boundary are subject to a Tree Preservation Order (TPO) so it is important to embrace them as part of the design. The back garden is south facing and this means that it is in shade for most of the day. 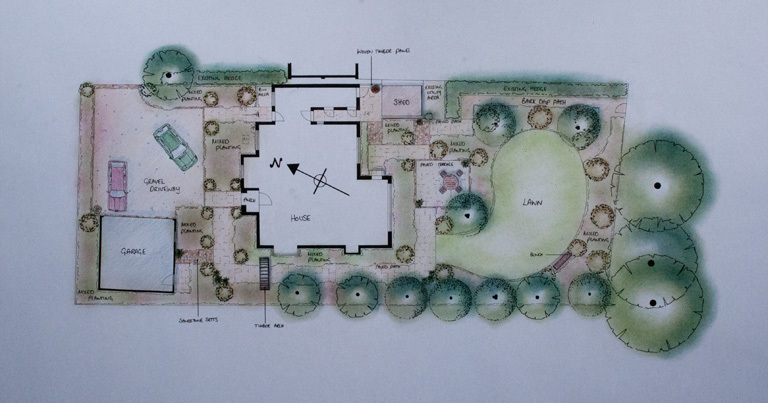 We have therefore settled on a woodland feel for the areas around the lawn as this will link in well with the oak trees. Look out for future posts during the construction phase of the project where I’ll share the progress with you. 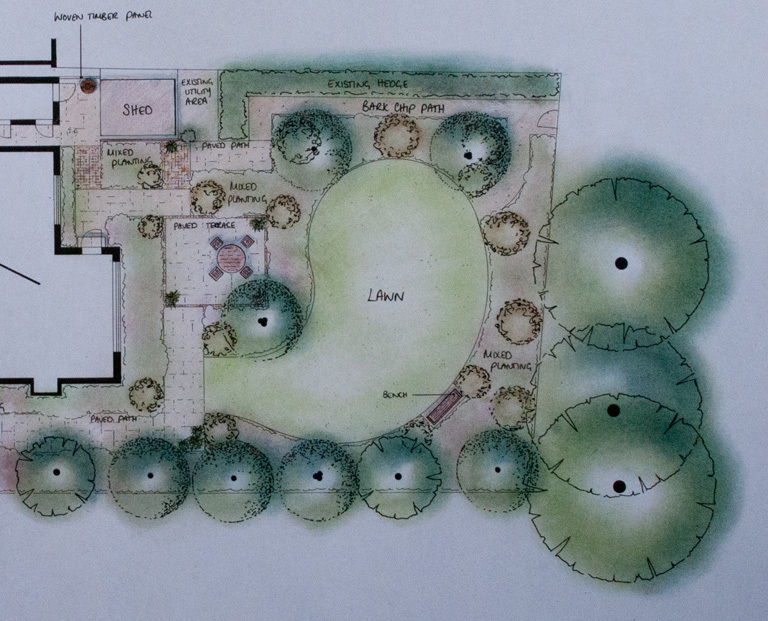 The estimated timescale for the build is 6-8 weeks so it’s perfectly timed for an autumn planting season.